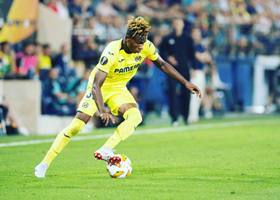 Villarreal manager Javi Calleja has described ex-Golden Eaglets winger Samuel Chukwueze as a talented player and is backing him to break into the first team if he continues working hard. The coach of the Yellow Submarine pulled off a surprise by naming the teenager in the match day squad for Thursday's Europa League meeting with Rangers, then handed him his debut off the bench in the 79th minute when he replaced Nicola Sansone. Signed from Diamond Academy in the summer of 2017, Chukwueze played for the Villarreal Juvenil A last term but was promoted to the reserve team ahead of this season. ''We’re using nearly all of our players and I think that’s a good thing. We need the whole squad,'' Calleja told Villarreal's official website. ''Today, for example, Samuel Chukwueze made his debut, who is a player with a great future, but he has to carry on working hard." Villarreal's next competitive game is a derby against Valencia at the Estadio de la Cerámica this Sunday.